This article is part of Mtbr’s Ultimate Base Camp feature. See all the stories in this special section here. If bears could read, they’d probably be pretty damn pissed about the Grizzly Cooler. That it’s specifically designed to preclude their access is one thing, but to actually name it after one of their subspecies, well that’s just taunting. 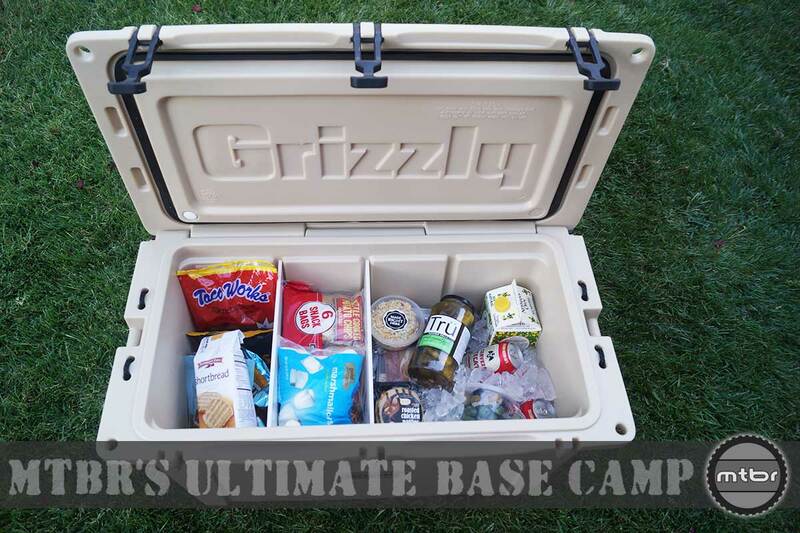 The name does however aptly describe the cooler’s rugged personality, and with exceptional insulating qualities, a configurable interior, and the aforementioned bear-resistance, the Grizzly might just be the ultimate basecamp food storage solution. Much like our refrigerator at home, the cooler became the center of our camp kitchen. Its 75-quart capacity made it not only big enough to store our iced, cold storage items, but by inserting or removing any of the three interior divider panels, we segmented part of the space as a critter-proof pantry for dry foods as well. Grizzly claims their coolers–insulated with a high-effectiveness, enviro-friendly foam–will keep ice for an astounding 19 days. What little runoff we experienced in our much shorter trips flowed into a channel molded in the cooler’s floor then dispersed to the unit’s dual two-inch drainage ports–a configuration that made cleaning and drying a breeze as well. Other premium touches include a refrigerator-like rubber gasket, rope carry handles with comfortable nylon sleeves, a stainless-steel hinge pin, durable stretch rubber latches, and slots for tie-down straps. Sets of holes molded in both the tub and top make the cooler lockable, and a pair of padlocks is required to meet bear-resistant standards, though we secured ours with a single caribiner. Had we been in bear country, we’d definitely go with locks. At $430 the made-in-the-USA Grizzly 75 is expedition-grade and priced. It’s available in five other sizes–16-, 40-, 60- and 400-quarts–and numerous colors including custom tones. It’s both designed to last and backed-up with a limited lifetime warranty. Call me nostalgic, but there’s something about the hammered green steel finish of a Stanley thermos that sends waves of anticipation down my spine. 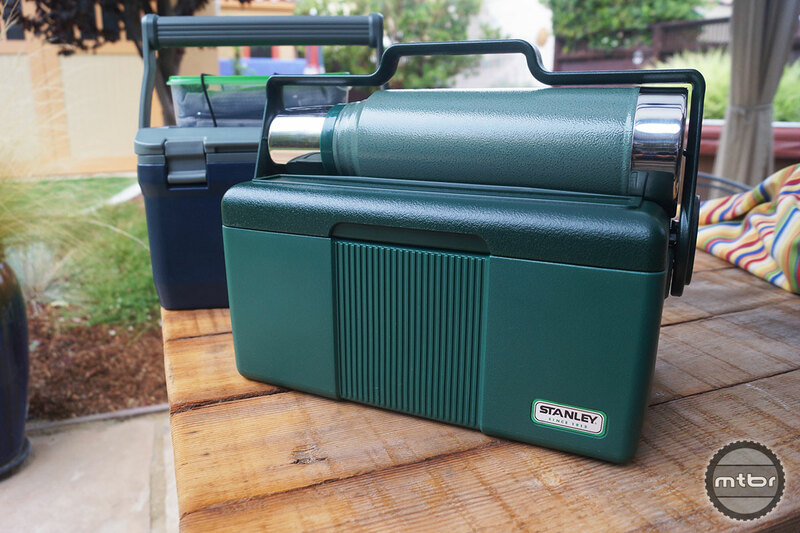 Growing up, a Stanley came standard on family fishing adventures, and even if the fish weren’t biting there was always something good in the thermos. It was one of those comforting prerequisites, as necessary as a pole, fishing hooks, and bait. And while a thermos is perhaps a little less essential when it comes to mountain biking, using the Stanley gear to-and-from the trailhead proved a good call. Their new-for-2014 ultra-insulated Adventure Cooler ($40) boasts a 7-quart capacity and accommodates up to nine beverage cans, though we usually loaded it up with a balance of recovery drinks and snacks to help ease that post-ride famished feeling. The plastic cooler features thick, insulated walls as well as a gasket-seal lid, and is rated to 27 cold hours. 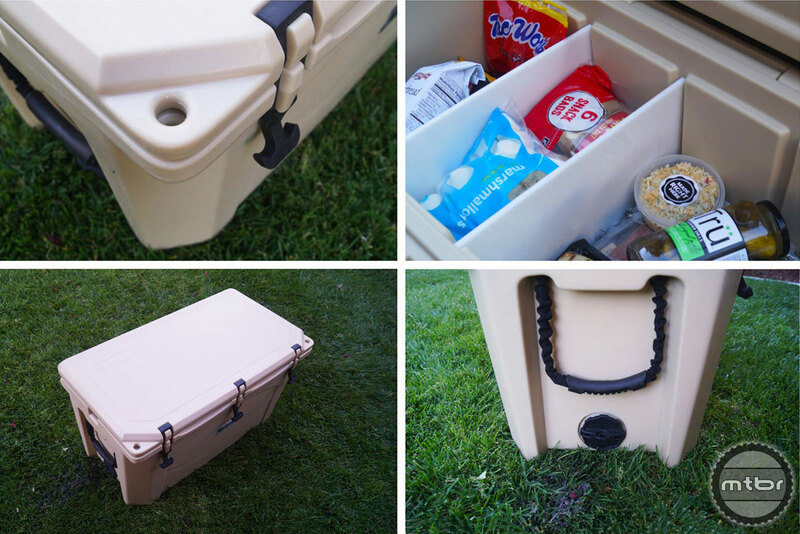 An adjustable elastic tie-down on the Cooler’s lid lets you secure a thermos or drink bottle, though we frequently ended foregoing such and using the tough little chest as a stool or seat. A pair of specialty bottles–their One Hand Vacuum Mug ($25) and Classic Wide Mouth Flask ($25)–do yeoman’s duty for the transport and distribution of requisite mountain biking caffeine and alcohol. The former, Stanley’s take on the travel coffee mug, features the same vacuum-insulated steel construction of their thermoses, and adds a push-button lid that fully disassembles for deep cleaning. Campfires are great for heat, camp ambiance, and making s’mores, but when it comes to cooking on a mountain bike trip, we prefer the convenience and reliability of a quality camp stove. 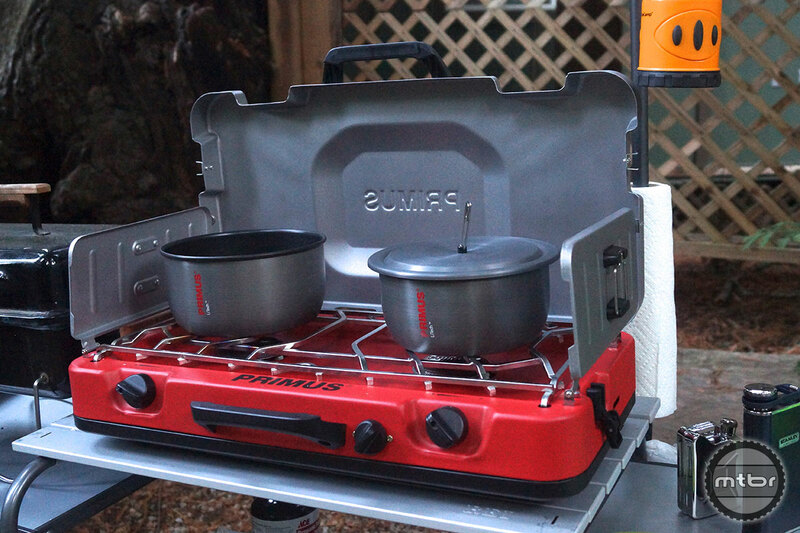 Primus’ FireHole 200 takes the idea of the classic Coleman stove and adds Ferrari-like looks and performance. The 24,000-BTU, piezoelectric ignition, dual-burner stove runs on standard 16-ounce propane cylinders, and boasts a three minute boil-time. We found cooking on the $175 Primus mostly on par with home kitchen cooktops when using high heat, but like many camp stoves, finding a low simmer setting is tricky–the finicky valves required a deft touch to get the flame really low without going out. Though compact, the 14-pound unit boasts ample room for using a frying pan and boil pot simultaneously, particularly if you use a camping-specific set like we did. Primus’ LiTech Super Set aluminum three-piece cookware kit features a 7-inch, 1.4-quart small pot; a 7.5-inch, 1.8-quart large pot; and an 8-inch frying pan, all clad with a non-stick titanium coating for easy cleanup. The set serviced up to four people nicely, and worked well for the medium-complexity meals we tend to prepare for such trips. The $64 set weighs a scant 1.8-pounds and includes a pot gripper, an indented lid that works on both pots, and a convenient vented stuff sack. But is any of it Enduro compatible? I’m gonna throw a plug in for the Coleman duel fuel two burner camp stove. If you can get the old version #520 I think with the Leather baffle on the pump- even better. These are 5* stoves. I second the cleman dual fuel and even upped it with a primus $24 conversion. Now its a 3 fuel dream. Throw in a proper perculator I’m one happy camper. Row, Love to hear what your setup for java is. We’ve been doing Aeropress and digging it. In fact, we should have included it! Danny – All we can do is relay that the manufacturer says it passes the standardized test for bear-proofness. We know bears in Yosemite have peeled car doors back like the top of a sardine can to get at errant french fries in the back seat…so yeah a grizzly could probably get in. For the most part we camp in raccoon territory and are happy to report those little b*stards have yet to infiltrate! Freeze 1 gallon water bottles, use them instead of ice. Melts into drinking water with no mess. If your cooler is good it will last a solid 4 days of camping. I am glad your Primus stove was so nice. I purchases one too, only to promptly return it. What junk. The grates were warped from welding and out of alignment by over 1/2 an inch. The metal was flimsy as a paper plate, and those little magnets to hold the side panels…please, my 5-year old blew on it and they folded. I will never get rid of my 1971 Coleman 426 stove.